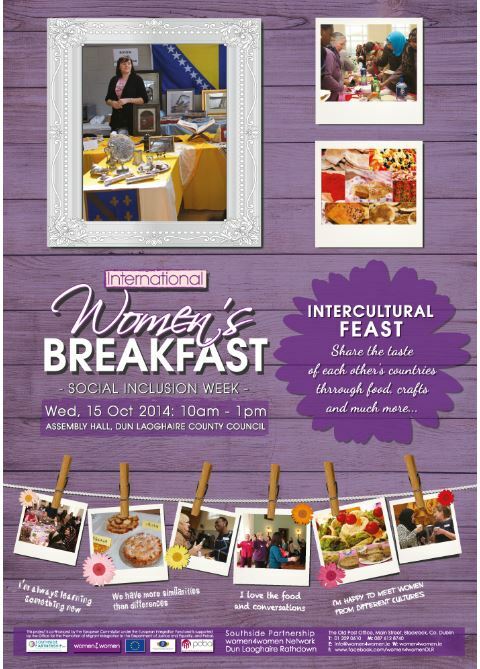 Women4women would like to invite you to our Social Inclusion Week International Women’s Breakfast on Wednesday 12th October. The event is from 10.00am-1.00pm in the Assembly Rooms, Dun Laoghaire- Rathdown County Council Offices, Marine Rd, Dun Laoghaire. The Dart and buses 75, 46a and others go nearby. This year we are celebrating our 5th Anniversary so we really hope that you can celebrate with us. Also, please remember that the foods from different countries are a big part of this event, so remember to Bring a Dish, and of course, Bring a Friend.